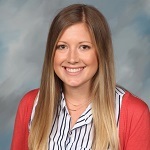 I am Mrs. Selmanson and I am so blessed to have the opportunity to teach at Los Altos Grace! I was born and raised in Tempe, Arizona. I am the oldest of eleven children, and my family is a very important part of my life. Growing up in a large family, I always knew I wanted to pursue a career working with children. In 2015, I graduated from the University of Arizona with a degree in Elementary Education, got married, and started a new life in Bullhead City, Arizona. My husband and I recently relocated to Orange County to be closer to our family. When I am not at school I enjoy reading, working out, cooking, and spending time with family. Creating an environment in my classroom where my students feel loved, safe, and comfortable being their true self is my focus of each school year. My passion is to build a learning environment that meets the needs of every student. I focus on multisensory and hands-on learning. After teaching in public school for three years, I am so excited to be able to share my love for the Lord and teach at the same time!